MalletKAT / VibeKAT :: VibeKAT - Alternate Mode, Inc. The VibeKAT contains all of the expression and dynamics of the legendary MalletKAT, but now offers an entirely new simplified interface. The concept of the VibeKAT is that each of its 100 User Kits are completely preprogrammed. Features like dampening and layering no longer need to be assigned. The user does not have to program any parameters in order to perform. This product is perfect for schools and for musicians who just want to call up a sound and play. 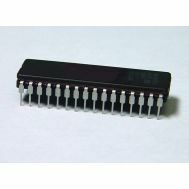 100 Pre-programmed User Kits for the (included) Ketron SD1000 sound module conveniently arranged into ten sound groups. Simplified Interface. No programming needed. Four octave, solid white body construction. Water resistant pads include a coated nylon top that protects the pads from scuffing and from fading in direct sunlight when played on the field. 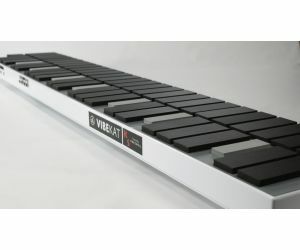 How is the VibeKAT different from a MalletKAT? The VibeKAT performs similarly to the MalletKAT and offers many of the same global settings to tailor your style of playing - including pad training, thresholds, and velocity curves. However, keeping the interface of the VibeKAT as simple as possible also means that many user kit settings and parameters are not accessible. We feel that this simplified interface is perfect for those who are not interested in programming. However, if you decide later that you want the full feature set offered by the MalletKAT, an upgrade chip is available in our online store. The three-octave vibeKAT Pro contains all of the expression and dynamics of the legendary MalletKAT, but now offers an entirely new simplified interface and 100 preset sounds for the (included) Ketron SD1000 sound module. 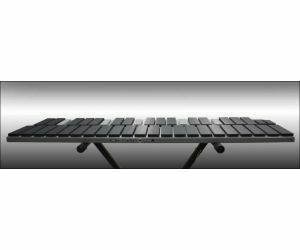 Just like the MalletKAT, it is the world's most powerful MIDI percussion mallet controller and uses true FSR sensing technology. All controllers are BUILT TO ORDER. There is currently a 2 week lead time. The four-octave vibeKAT Grand contains all of the expression and dynamics of the legendary MalletKAT, but now offers an entirely new simplified interface and 100 preset sounds developed for the (included) Ketron SD1000 sound module. 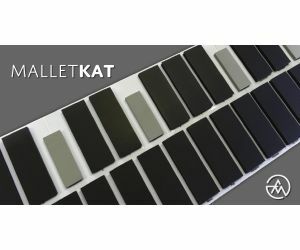 Just like the MalletKAT, it is the world's most powerful MIDI percussion mallet controller and uses true FSR sensing technology. 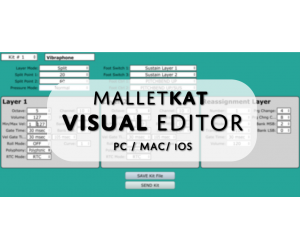 Convert the simplified interface of the vibeKAT to a full featured MalletKAT with this chip upgrade.